Thankfully for the briefing hadn't taken too long. Bryan completely understood the reason behind the briefing but it didn't mean he wasn't tired and ready to stop. When it seemed like things were winding down her let out a soft breath, not wanting anyone to hear him. He did sit up straighter though when Ben walked into the room. "You're looking much better then before, Colonel," he grinned. He was glad that the docs had been able to patch Ben up. "Yes, sir. Good luck," Tilly finished breathlessly. For the reason to saying Good Luck to a seasoned warrior, she had no idea why. Closing her eyes, she shook her head and tapped her forehead. Taking her position beside the doorway, the sergeant kept a good look out and waited patiently for two things. Her beating heart to slow down in to pacing mode and her orders. When the Colonel dismissed him, Taer stood in respects just as Ben entered. He rose his eyebrow at that chance of it happening. Standing in the presence of another commanding officer. Standing by, he placed his arms behind his back and spoke in acknowledgment to his commanding officer, "Colonel," As a man of few words, there wasn't much for Taer to say other than to dismiss himself. Jon inclined his head politely at the dismissal, then waited to follow the rest of his team out of the briefing room so he could actually breathe for a little bit. And just like that it was over. Darned quickest debrief Bonnie's ever had, yet she more than anyone truly appreciated it as her mind too often tended to wander if she sat too long listening to the dissection of something she had just lived through in full living colour. Ben Mac's returned lifted her spirits a little, to her he was like a big cuddly bear. Of course no one could take Bryan's place, Ben was more like someone she wished she could have had as a brother rather than that useless excuse of a Max. Hopefully he was rotting in some prison somewhere far away from her family. Grim thoughts. ''Good to see you're in one piece Colonel, you had us worried back there you know. Even if it was your arm....I mean that was a lot of blood.'' Probably not as much as it could have been, it just looked that way to her. ''Down time while we can as he said.'' Bonnie whispered to Bryan and Jon. "The second site will be dealt with, but I don't know how yet. We're running that down and unfortunately, politics are going to play a role here." Ian replied, standing up, "Everyone go get some chow and stand down. Dismissed." He said. "Admiral, its Walter sir. SG-7 from the Alpha Site has just radioed in from P4H-51Y, they need a follow up team to get back there. From Captain Coffin's report sir, he's telling me that they might have found what appears to be the base crystals ZPM's are made from." The man was either immune to pain or simply as Al had found that these Aussies were just off the edge of being a masochist. He'd seen it before with one or two others of the same ilk, and if it were him bearing that wound there'd be no doubt Al's face was going to show it. "Between you and your sister Ben, I think you're both in competition to pass General O'Neill's sterling record he's established with the infirmary. We're all glad you made it in one piece, that's what counts the most." "Always is Admiral." Politics, the SGC had been hampered by it for years and was still beholden to it in some aspects. "Thank you sir. Right people, we all heard. Stand down until further notice." Bryan wasn't about to look a gift horse in the mouth. He was wiped out and if the past was anything to go by it could be a very short reprieve that they got. "Don't have to tell me twice," he answered softly, moving to get up. Bryan grinned at Bonnie as he got to his feet. "Chow sounds great. Then some down time." He wouldn't mind kicking his feet up for a few minutes. "Admiral." Ben said as he turned to leave. "I'll catch you lot later on SG-9, and I'm sure we'll be having the pleasure of working together again. I'll just drop down to the infirmary and see how Hurley is getting on, if you all excuse me." As he left Ben stopped to speak to the Kiwi. "Thanks for the company Sergeant, I appreciated that but now other matters are at hand for me. I'm heading back to Med bay there might be something for you to do down there but don't quote me on that. I'll see you soon." He left with a good feeling in his heart. Today wasn't such a bad day after all. Jon hoped his stomach hadn't rumbled to betray him, but chow sounded awfully nice. He nodded to Heckman and Walker and ducked out as soon as he could without being disrespectful. The team made their way up to the Briefing room by way of the control room and the stairs at the back. Gary had already pulled a chair aside for their weapons to sit, normally they would change out of their gear before a debriefing but it seamed like they were wanted straight away. He also pulled out a chair for SG-7 to place their long guns. Gary had learnt that if you hand in your gun to the armour, you spend a week trying to get your gun back. He had a hard enough time with an L-85. Though Harly and Charlotte sat comfortably, Harly to one side of the head of the table with her ZPM infront of her and her Tablet out bringing up all the information she recorded. Fred and Gary with their tactical gear on were unable to lean back, they didnt expect to be here long, not with so much going on. Gary could see Fred was stiff, though he had no idea how bad he was he just assumed crashing a jumper had shaken him a little. SFs collected weapons and gear to be taken back down to the Armory, giving the teams some relief, while some Airmen brought up water and Gatorade, along with a bowl of fruit and a plate of sandwiches, both PB&J and ham and cheese. SG-7 all took seats across the table from SG-12, and unlike this morning, they now looked tired but quite pleased with themselves. Even Captain Coffin seemed to smile a bit easier. Ian made his way up and took his seat at the head of the table. "I know we have more pressing matters on hand, but we can't ignore what you all found today. Major Rivers, your team made an impressive find of Ancient tech and gear that should keep Area 51 quite happy. Captain Coffin, your team may have just made the kind of find that will change everything." Ian said, "I'm proud of all of you, and I'm going to make sure that once we find SG-1, you are properly recognized." "That all said, we need to get an idea of what happened to SG-1, and you all were the last to see them. Now, you all found something suggesting alternate locations?" Ian asked. "Yes, sir. The database in the Ancient facility was heavily corrupted, but we found two addresses. Both were known but not explored by the SGC. I think our site was cataloged back around the time we were still dealing with Apophis." Astrid said. "I think someone on SG-12 summed it up best, P6G-12M was a sort of distribution warehouse. Colonel Mitchell let me pick one site, he took the other, we didn't know what we would find, though Doctor Jackson was convinced they would find the mine. Information we had suggested high value Ancient sites either which way." Brian added. Ian nodded, and glanced to SG-12. "Any of you have anything else to add?" Ian asked. Fred saw the bottles of water, and at first was dismissive then he remembered the Screech powdered drink packet in his plate carrier. 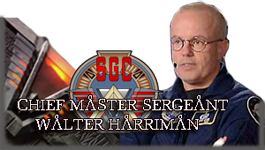 As Colonel Sanderson was back and forth between the SGC and MOD he often liberated British MRE box's for SG-12's missions, more so out of the tams personal preference over the American ones. He removed it and whilst the admiral spoke poured it in to a bottle of water and shook it up. Taking care to be quiet to not interrupt the Admiral or SG-7. But then the Admiral looked to his team and Fred Nodded. "I think so sir." He turned to Harly, closing his eyes for a moment as his ribs played up again. it would be just like his toe when he was a kid, it hurt for a while, but he ignored it and eventually the pain went away. He was sure it was nothing and he was just sore from crashing the Jumper. "Captain?" He asked as Harly pulled out her tablet and pulled up an Address. "I did a little digging before we left sir, there was a third address in the datebase that was flagged as important. I dont really know why sir, but if you look, out of the six symbols five are the same as earths address. Its not in any of our databases though theoretically its the closest gate to Earth. I dont know how we missed it but the database said its some sort of military outpost. I dont know why only that city ship had the information on it. So it could be worth a look." She gave a small shrug, her logical mind was telling her it had to be nothing. She didnt want it to be nothing but there were so many factors at play. Maybe there was a base there that wasnt there any more. Maybe it had been that city ships original address. There could be any number of explanations. "Pass that along and we'll look into it." Ian said. "Alright, we'll send teams to follow up things where you started from. In the meantime, I'm standing your teams down to recoup and recover. We'll have SG-4 and SG-18 check things out with SG-1's last known location." "Outstanding work, both teams." Ian said, "If you need any medical attention, head to the Medbay, otherwise, get something proper to eat and take one of the available rooms to crash out in if you don't already live here." Fred nodded and got up He looked to Coffin and gave a nod to him. "it was fun working with you Captain. Hopefully we'll do it again in the future." He was about to shake the mans hand but decided that was a little to much, there was a line he had to walk between to friendly and to professional. But after his team stood Fred sliped away to medical, he didn't want his team to know, no need to worry them if it were nothing. But after a moment the rest of the team left, Each heading off to do go relax for a little while.